The latest update of the Red List of Endangered species is bringing attention to a number of new animals now threatened with extinction. According to the World Conservation Union, we are facing an extinction rate 10,000 higher than was expected. According to the report, one in four animals is threatened, as well as 1 in 8 birds, 1 in 3 amphibians, and 70% of the worlds plants. Species added to the list are labeled as extinct (EX), extinct in the wild (EW), critically endangered (CR), endangered (EN), vulnerable (VU), lower risk/ conservation dependent (LR/CD), near threatened (NT), least concern (LC), or DD for data deficient. All this information is housed in a major database with the World Conservation Union and can be accessed here. When searching the database you can type in the common name for a species and will get results including the species scientific name, and level of endangerment. Clicking on a specific species will provide more information on taxonomy, and citation information relating to how the species was evaluated for inclusion in the Red List. In the photo gallery you can find photographs of a few of the endangered species along with a brief explanation of its current situation. This new list should make us all aware that while there are efforts out there to preserve wildlife, they are not providing the desired results, and further action should be taken to correct the situation. You can read more about this from an article in The Hindu. There is another article in Practical Fishkeeping about discussing fish on the Red List. 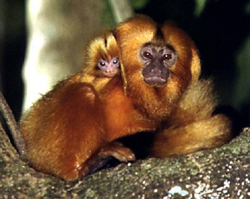 Image info; Golden Lion Tamarin, (Leontopithecus rosalia), EN. Image from the World Conservation Union.